On February 8, 1587, Mary Queen of Scots was executed, which has, of course come up a few times in films and TV shows depicting her life. What’s interesting is that the outfit she wore to her death has been pretty well documented since the actual event occurred — but, of course, that doesn’t mean that every on-screen version gets it right. “Her satin dress was all in black, embroidered with black velvet, and set with black acorn buttons of jet trimmed with pearl; but through the slashed sleeves could be seen inner sleeves of purple, and although her shoes of Spanish leather were black, her stockings were clocked and edged with silver, her garters were of green silk, and her petticoat was of crimson velvet. OK, so she was probably trying to make a point, given that she knew the event was something of a spectacle and she was always very conscious of her own status in the world. But she also didn’t push it to crazy heights by wearing bright red — given her background as a born-and-raised queen, perhaps that didn’t suit her dignity. She made her point distinctly, regally, true to her faith, and without excess. How has this been portrayed on screen? Well, it starts out good and then goes to hell! I’m only including this one for amusement’s sake. 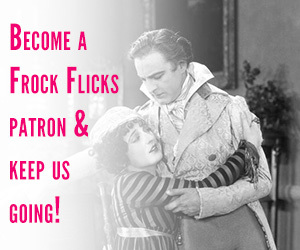 It’s an early film by Thomas Edison, and Mary is portrayed by the wife of his company’s treasurer. The beheading effect is created with one of the first jump-cut camera tricks ever used on film and was truly startling to early audiences. 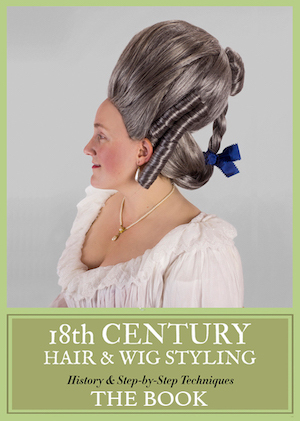 However, I have no idea what color the costume is (not that it appears all that 16th-century in style). 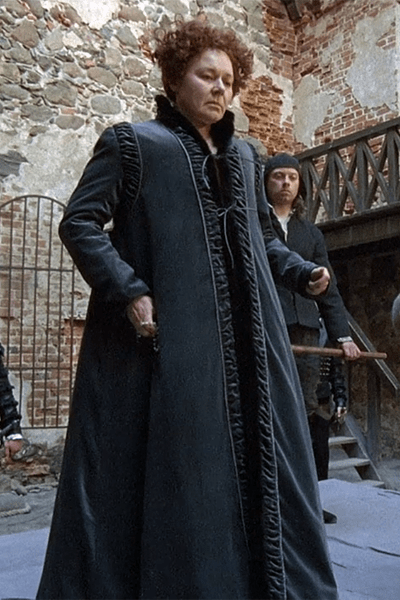 It should come as no surprise that this insanely excellent miniseries has the best depiction of Mary’s execution garb. As with all the costumes in the show, Mary’s clothes in her brief appearance are historically accurate as possible. 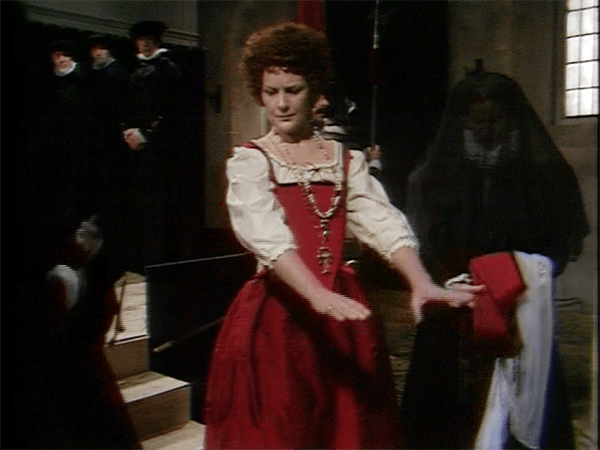 For her execution, she walks in wearing a black gown that is removed to show a dark red kirtle, then her ladies attache red sleeves to her gown. It is precisely as described in Fraser’s biography. 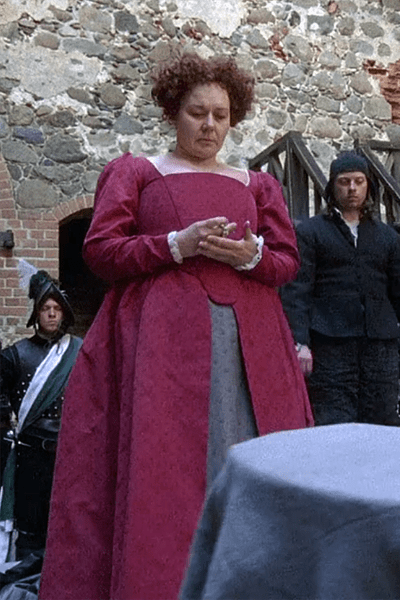 She enters wearing black — it appears to be a surcote or loose gown, which works better than a doublet on TV for expediency. Putting on her red sleeves. This feature film takes a more theatrical approach, as is typical. 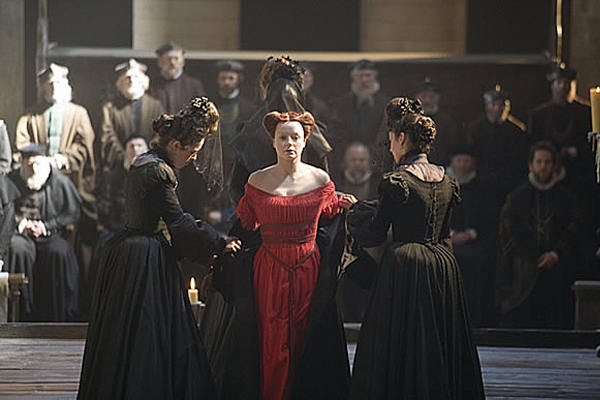 Mary does arrive at her execution in black and disrobes to reveal a red gown, although the design is more of an approximation of 1580s than a precise reproduction. 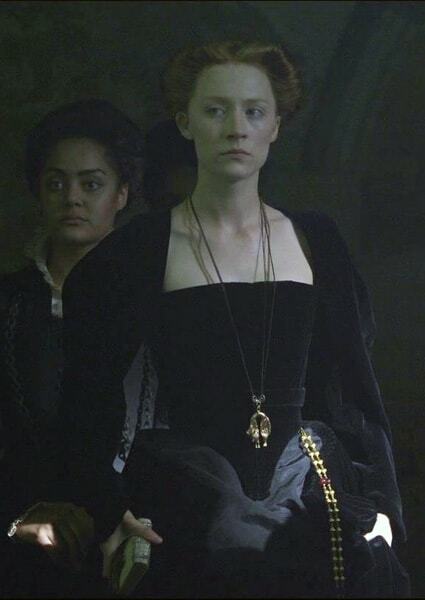 This two-part HBO series won several awards for costume, but I feel like O’Neill concentrated all his best work on Helen Mirren as Queen Elizabeth and gave very little attention to Mary Stuart, whose execution was a key plot point in the first episode. She gets the red reveal but the quality of both outfits feels subpar compared to everything else in this show. What this execution lacks in historical costume, it makes up for in gruesome axe-wielding. Again, a surcote, which I’m fine with, but it looks like bathrobe velour and I side-eye that funky ruched trim. Here’s where things really go off the rails. 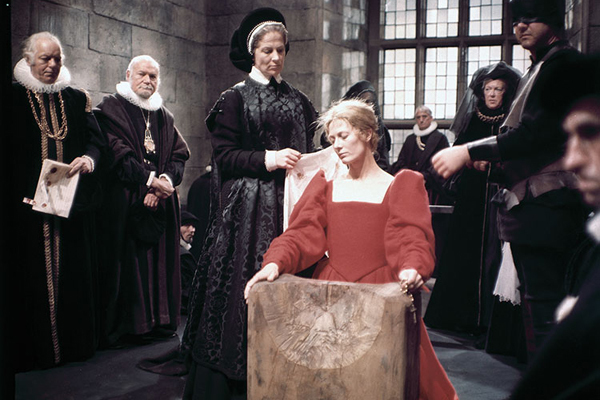 Director Shekhar Kapur didn’t claim to be making Elizabeth (1998) or this sequel as truly period pieces, but whoa, WTFrock is going on with this red chemise for Mary’s execution? It looks like she’s stripping down to a fantasy grecian pre-raphaelite kind of underwear — none of which is appropriate for a 16th-century queen. It’s also really bright red! Including just to be complete since the show did execute Mary in the series finale. She only had a black dress though, satin with a scoop neckline and giant bell sleeves. Whatevs. When this is the least offensive dress of the bunch, you know something’s amiss. Yep, there’s a zipper. Off with her head! It’s a repeat! Did Alexandra Byrne not have enough budget for a new dress? Or was she just feeling lazy? I don’t care because it’s still wrong. Also the black gown literally RIPS AWAY to reveal this red chemise like some velcro striptease. I laughed out loud in the theater. Fine, sure. But why is she wearing what looks like the Order of the Golden Fleece? Guess it’s not the exact same dress as in Golden Age — look at that crochet trim at the neck and sleeve! What historical moments on screen make you go “huh”? I’m creeped out by Fraser’s description of Mary’s garters. Who was looking that high up her skirts? Maybe the garters and stockings were reported by the ladies who helped her dress. Or those who dealt with the body afterwards. There were a lot of ppl involved & they allllll wrote about it. Not part of the costume but what about the dog underneath her skirts? Did that really happen or is that some madness I picked up in a bad book? Yep, that’s in Fraser’s biography — the little dog hid under Mary’s skirts all thru the execution & was discovered by the ppl taking care of the body after she was dead. Does anyone know what it means when it says her was “embroidered with black velvet”? Was it some sort of applique or something like chenille embroidery? This period of history is not my period of expertise when in comes to clothing. I’ve always wondered about that myself. I can’t think what it could be but applique. Probably applique, but it could be a kind of couching as well. There were a lot of heavy surface treatments done that gave texture to garments in this period. OMG just when you think the recent attempt at MQOS couldn’t get any worse! I LITERALLY thought the MQoS dress was the same one from The Golden Age. It was such a direct copy of the earlier film (right down to ripping off her cloak). Are you positive it isn’t, and that they didn’t just add the trim? Well, the stupid crochet is inserted into the middle of the arms — you can just see it. Would be a lot of work to retrofit that into an old gown. So why not make a whole new abomination??? I guess so, but if you have to remake an entire dress, why not change it up so it’s not a direct copy?? I think Sairose Ronan is a little taller than Samantha Morton so she must have just recycled the design rather than the actual costume. Like you would ever strip your Queen like that?? Red was of course the color of martyrdom and Mary spent her last days posing as a martyr to her Catholic faith. Maybe it gave her some comfort. My fav is Elizabeth R and Vivien Pickles. Seems to be the best and is in line with the costumes of Elizabeth I played by my favourite ERI Dame Glenda Jackson (if she’s not a Dame, she should be. Although if she’s still a MP, then she’s the Right Honourable). The martyrdom red of Ms Pickles Gown which is probably the red the accounts were either mentioning directly or strongly hinting at was as you know due to Mary’s staunch Catholicism and she was put up for sainthood at the time by several European Catholic monarchs. I’m am similar to the author of this piece except my obsession is Elizabeth 1 and Anne Boleyn with Mary Q of S is a strong interest also..
With regards the costumes and historical accuracy, the various design of gowns for Mary’s beheading is terrible and not worthy of her legacy least of all on film.. What I can is when Glenda Jackson was asked to play the role of Elizabeth she refused more than once saying the historical accuracy was off and so she declined, after long negotiating Glenda accepted the role but on the conditions that the historical content was as accurate as it could be including costumes as well.. So that’s why even after forty or so years it still stands out as the best in all aspects including the beheading of Mary and her costumes.. As far as I’m aware it’s the only one where they incorporate her little terrier dog found under her skirts as its showed next to Mary’s headless body.. In real life that poor little dog was so distressed it died not long after Mary. . A pitiful and sad ending for both that really touches your heart.. Personally I am team Elizabeth all the way which gives me a very jaundiced view of Mary. I blame my bias on Elizabeth Jenkins’ Elizabeth the Great but honestly nothing I’ve read since has substantially altered my views. Just when I thought I couldn’t love the mighty Glenda Jackson more! If Reign hadn’t wasted so much time on the nonsense in France with Charles and Henri apparently getting in a fight over a fictional girl, maybe Mary could’ve had a SLIGHTLY less embarrassing gown. But, really, a zipper? The one thing WORSE than metal grommets? Nothing is worse than the velcro tear-away combo IMO! Send it to Dita von Teese. There’s also the element that some costume designers/art directors are not good historians when it comes to visual images. So they often use paintings which they think might be correct without understanding that artists their own issues of artistic license and timeliness. 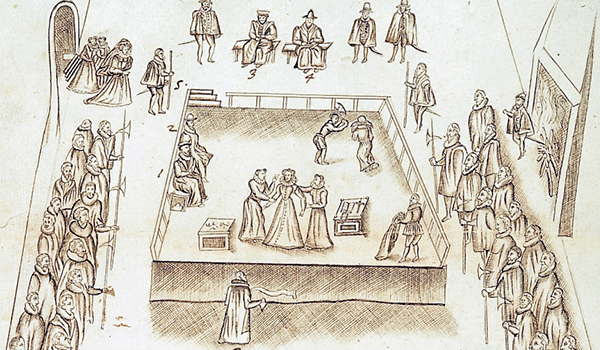 Like this image of the Execution of Lady Jane Grey (which was supposed to be Mary Queen of Scots, but the artist couldn’t sell it). The red is the correct color, but note the 19th C off the shoulder neckline. Did any of these renditions deal with the fact that it took three tries to completely decapitate Mary? Also, eyewitness accounts state that her ladies blindfolded her before she laid her head on the block, and she had to feel for it with her hands in order to locate it. The 2005 Elizabeth I is particularly gruesome with the axe. Blindfolding the execution victim is traditional, but films may not choose to do it because of how it it appears on screen. Thanks! I hadn’t seen that one; Glenda Jackson (and maybe Bette Davis) are my go-to Elizabeths. Do you think it makes Mary appear more of a martyr to show her placing her head stoically on the block sans blindfold? I think it’s a mix of how the actress looks with a blindfold, does the director want the audience to identify with the character, will there be close-up shots, & overall feel of the scene. 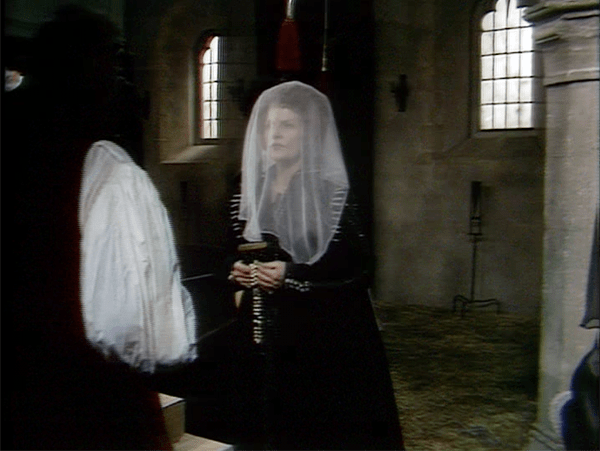 I compare with Anne Boleyn execution scenes where she’s blindfolded (again, traditional, typical) & it’s often played for pathos to make the character look sad & sympathetic after being tempestuous & calculating. MQoS tends not to have that kind of story arc, & her death is played as a virtue (& historically, her motto during captivity was ‘in the end is my beginning’), so if a director considered blindfolding to appear sad & pathetic, they’d avoid it, I suspect.